Over the last years, minimizing minimally invasive surgery via Natural Orifice Transluminal Endoscopic Surgery (NOTES) has become the new frontier among surgeons. Although the feasibility of hybrid NOTES has been shown with good success, reports of human total or pure NOTES procedures are very limited to date. This new minimally invasive approach is believed to result in reduced post-operative pain, reduced incidences of incisional hernias and wound infections and improved cosmesis compared to laparoscopic surgery. It should also allow for faster return to daily activities as well as shorter hospital stay and therefore has the potential to reduce health care costs. 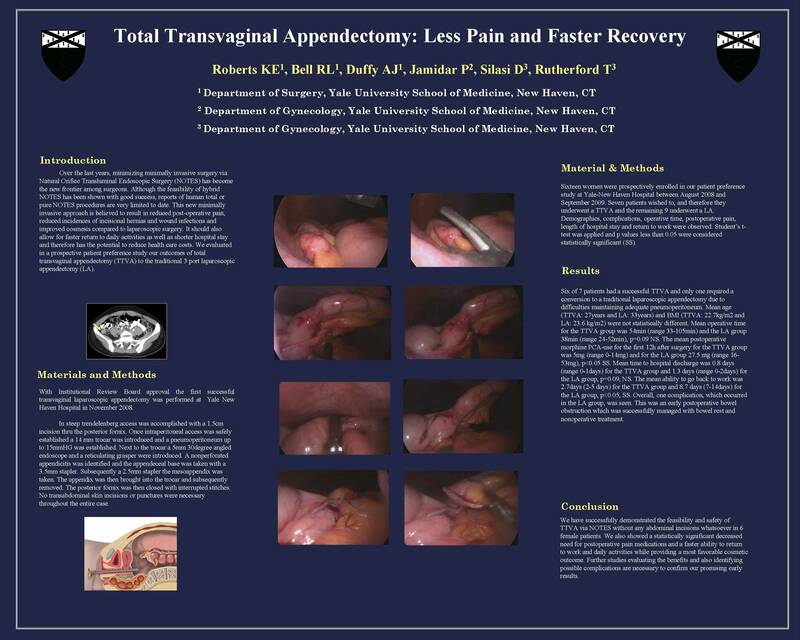 We evaluated in a prospective patient preference study our outcomes of total transvaginal appendectomy (TTVA) to the traditional 3 port laparoscopic appendectomy (LA). Sixteen women were prospectively enrolled inour patient preference study at Yale-New Haven Hospital between August 2008 and September 2009. Seven patients wished to, and therefore they underwent a TTVA and the remaining 9 underwent a LA. Demographics, complications, operative time, postoperative pain, length of hospital stay and return to work were observed. Student’s t-test was applied and p values less than 0.05 were considered statistically significant (SS). Six of 7 patients had a successful TTVA and only one required a conversion to a traditional laparoscopic appendectomy due to difficulties maintaining adequate pneumoperitoneum. Mean age (TTVA: 27years and LA: 33years) and BMI (TTVA: 22.7kg/m2 and LA: 23.6 kg/m2) were not statistically different. Mean operative time for the TTVA group was 54min (range 33-105min) and the LA group 38min (range 24-52min), p=0.09 NS. The mean postoperative morphine PCA-use for the first 12h after surgery for the TTVA group was 5mg (range 0-14mg) and for the LA group 27.5 mg (range 16-53mg), p<0.05 SS. Mean time to hospital discharge was 0.8 days (range 0-1days) for the TTVA group and 1.3 days (range 0-2days) for the LA group, p=0.09, NS. The mean ability to go back to work was 2.7days (2-5 days) for the TTVA group and 8.7 days (7-14days) for the LA group, p<0.05, SS. Overall, one complication, which occurred in the LA group, was seen. This was an early postoperative bowel obstruction which was successfully managed with bowel rest and nonoperative treatment. We have successfully demonstrated the feasibility and safety of TTVA via NOTES without any abdominal incisions whatsoever in 6 female patients. We also showed a statistically significant decreased need for postoperative pain medications and a faster ability to return to work and daily activities while providing a most favorable cosmetic outcome. Further studies evaluating the benefits and also identifying possible complications are necessary to confirm our promising early results.